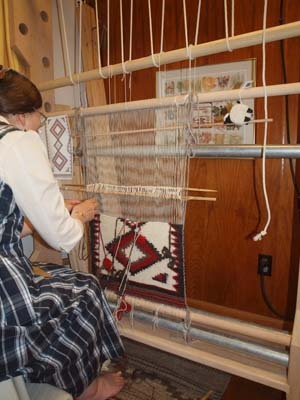 Developed so that Sara could continue the skills learned from Sarah Natani and Mary Walker, Hans has developed plans for a full sized Navajo loom and warping frame. Based on a photograph of a loom located at the Hubbell Trading Post and some modifications suggested by Sarah Natani, the loom will easily weave a 3' by 5' piece straight up or nearly 4' by 8 or more feet using the up and over warping method. Warping Frame. Made from inexpensive lumber from any building supply. Knocks down easily for storage. 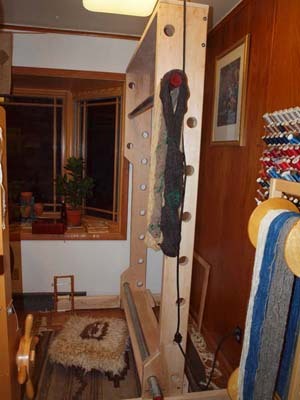 This eliminates any need to tip the 7 foot loom on its side for warping. Holes drilled at regulatr intervals eliminate the need to put nail hols in the frame - length determined by metal pins that fit in the holes. This loom is extremely stable. 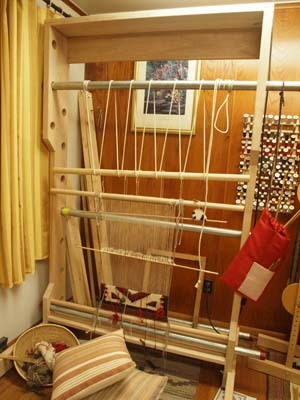 The bottom support board is high enough to allow the weaver to put feet and legs beneath it comfortably when starting a piece. The holes and metal pipes allow the weaver to adjust the placement of the weaving to allow for comfortable weaving. If beginning at floor level is not comfortable, the piece can be mounted at a higher level to start. 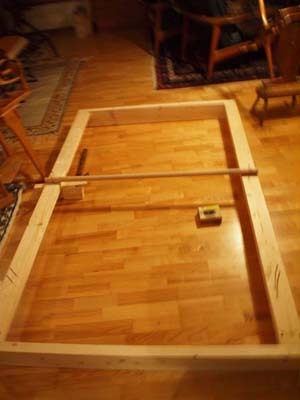 The massive frame holds tension much better than smaller table models - giving better results even for smaller pieces. These are printed on large paper with clear dimensions and hardware lists. Copyright: The Woolgatherers, 2012 for personal use only. Flax stricks for dressing the distaff are practically a thing of the past â€“ or the result of our own flax cultivation. Industrial spinning mills require a type of roving rather unsuited to the hand operated spinning wheel. Commercial grade fiber flax seed is readily available. 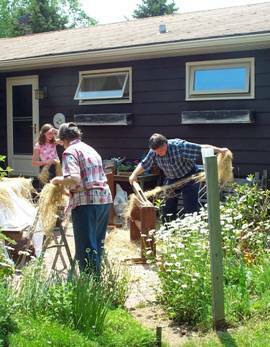 Most persons with access to a garden can grow their own flax straw. Also, retted and rippled flax straw is available for handspinners. To prepare stricks from flax straw requires a set of tools â€“ ripple, brake, scutching board and knife, and a set of hackles. While some may be available through antique stores and auction sites, it is not easy to purchase a set. These plans are based on traditional tools using contemporary materials. Materials needed are listed on each sheet. Wood should be of good quality. If sufficient quality in a single board is not guaranteed, plywood may be substituted â€“ except on the blades of the brake which should be of single hardwood boards. Nails and screws are standard â€œpennyâ€ sized nails and standard wood screws found at building supply stores â€“ exact sizes given for each tool. Plans are printed clearly on 11" x 17" sheets (Sheet 1 of Brake plans 22" x 34") for easy readability. Hackle plans include full sized prints of the tine spacing that can be glued to the backing for more accurate insertion. Nice book showing how to make knotted pile carpets on a simple upright loom. Currently the only book in print with this information. 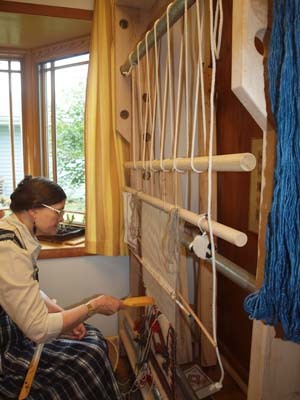 No photo - based on the sample loom in the book. 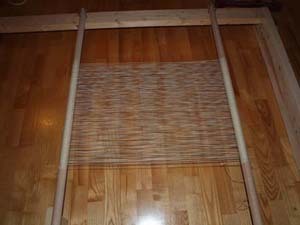 Several customers have successfully built this loom and produced nice results. Based on a 1 7" model, there are instructions included how to make a larger model if desired. The Woolgatherers continues to develop plans and drawings for textile tools. We can supply modifications to the Lilla looms that we sell, including plans for loom extensions and braces for rug weaving. Hans is also able to recreate broken parts from vintage looms and spinning wheels. If you would like assistance developing plans for textile tools, or having custom parts/tools made, contact us using the INquire Form below.